It's hop harvest time in the Northwest! That means brewers across the state are busy brewing fresh hop beers. Also known as wet hops, due to their high water content, fresh hops are unique because they not kiln dried. As a result, these hops are extremely perishable and must be used within hours of being plucked from the bine. What's all the fuss about? First, these beers can be brewed only at harvest time. Second, the delicate hop aromas and flavors are very volatile and beers using them are best consumed fresh. Most fresh hop beers never make it to bottles and cans, so you'll need to seek them out on draft. 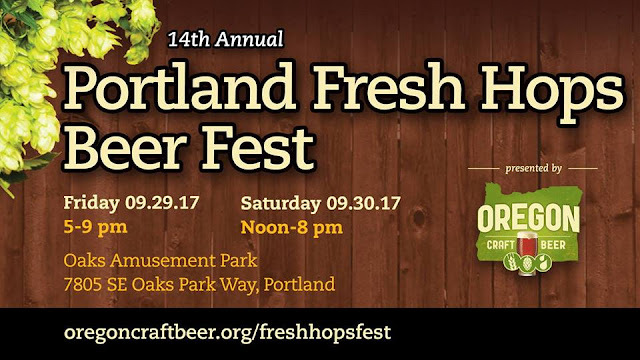 Or better yet, head to the Portland Fresh Hops Beer Fest, where you can sample from five-dozen fresh hop beers! For more details, check out the news release below. Admission to the Portland Fresh Hops Fest is free. Drinking packages cost $20 for a souvenir tasting glass and eight drink tickets. Advance discount tickets are on sale now at MercPerks (www.portland.altperks.com), offering two tasting glasses and 16 drink tickets for $28 ($40 value). General admission tickets will go on sale in September at www.oregoncraftbeer.org/freshhopsfest. Additional tasting tickets are sold on-site for $2 each or four for $5. Event parking is free. The festival annually features around five-dozen Oregon brewed fresh hop beers; the beer list will be announced in mid-September. As only one beer from each brewery is available, attendees are encouraged to arrive on Friday or early on Saturday for the greatest selection. The festival will also feature homebrew demonstrations of beer, kombucha and root beer from Portland U-Brew; a number of commercial vendors; and on-site food from Urban German Grill. Minors are not allowed on Friday, but are permitted on Saturday until 5pm (Oaks Amusement Park is closed that day, but the train will be running from 12pm to 5pm for kids accompanied by adults). Well-behaved dogs on leashes are welcome. The Portland Fresh Hops Fest is organized by the Oregon Brewers Guild. Learn more at www.oregoncraftbeer.org; follow the Oregon Brewers Guild on Twitter, Facebook and the Portland Fresh Hops Fest Facebook Event (#freshhops and #oregoncraftbeer). The Oregon Brewers Guild is a non-profit organization whose mission is to promote the state’s craft brewing industry and the common interests of its members. Founded in 1992, the Oregon Brewers Guild is one of the nation’s oldest craft brewers associations. The Guild, which receives no state funding, comprises 160 brewing companies, 130 associate or supplier members and more than 4,000 enthusiast members or S.N.O.B.s (Supporters of Native Oregon Beer).